Whether looking for a course for smallholding based personal cheese making or a course to cover commercial production, please contact us. The dairy was established in 1987 and we have taught a great number of prospective cheese makers during the last 20 years. The students have ranged from ‘a bucket in the kitchen’ to cheese makers in need of extra training. We are good at accommodating mixed ability groups. Yogurt, butter and ice-cream courses are difficult to schedule so please contact us and we will try to accommodate you. Milk type: - Cow, sheep and goat milk are available to the students. We no longer have milking sheep but are happy for students to bring their own milk including buffalo milk. Cheese making groups are normally 6 students. This is designed for those of you who would like to make cheese or improve your cheese-making skills. Day 1 All students will help make a hard cheese and soft cheeses. There will be discussion about milk, starter cultures, rennet and salt. Day 2 All students will make a hard cheese, on their own, in a small vessel. The previous days’ cheese will be attended to (press work). Day 3 The cheese press work will be completed and the finished cheeses packed ready for students to take home. There will be discussions about cheese storage, necessary equipment and sources of supply for small scale cheese makers. This course will be structured to ensure flexibility and is designed for cheese makers who want to extend their knowledge and skills. It can include hard, soft and mould ripened cheeses. Students are invited to bring problem cheeses to the course. 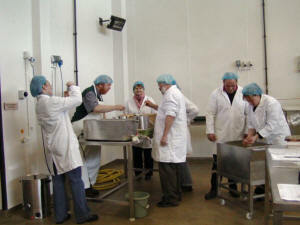 Day 1 The day will involve the manufacture of a variety of cheeses and can include mould ripened cheese. Day 2 The press work from day one will be carried out after which there will be lectures encompassing the science of each stage of the cheese process, with emphasis on the biochemistry of cheese maturing. Day 3 The press work will be completed where possible and the remaining time will be concerned with how to ‘trouble shoot’ problems. The course will normally combine these products and provide the basic principles of butter and ice-cream manufacture and ripened products. Day 1 The manufacture of ripened products. The principles and practice of milk separation. The formulation and preparation of an ice-cream mix. The importance of cream ageing for butter. Day 2 Butter manufacture and its storage, care of equipment. Freeze the ice-cream mix. The location of small scale equipment and sources of ingredients and cultures. • One day courses are scheduled as required. See our "Schedules" section for details of 3-day courses. Please see our "Prices" section for details of course fees. Please see our "Course Application" section to obtain a copy of our application.